Debut episode features head coach of newly-crowned state and national champion. 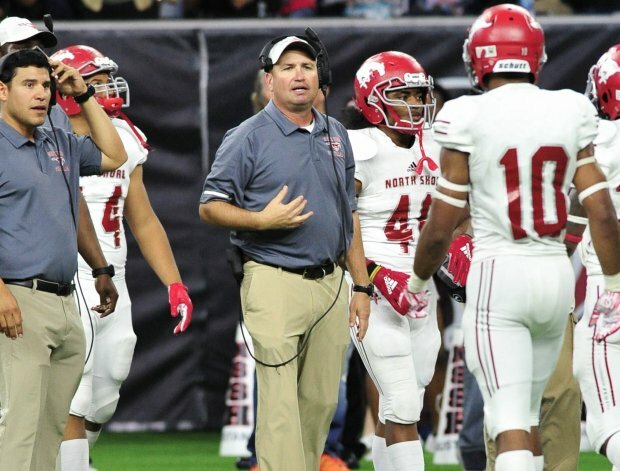 The MaxPreps High School Football Coaches Podcast makes its debut this week with state and national championship head coach Jon Kay of North Shore (Houston). So what's the secret to a 16-0 state championship season? Turns out, there is no secret but self-guided team leadership was a big factor for Kay and the Mustangs in 2018. "We lost to a really strong Katy team four weeks deep into the playoffs in 2017," Kay said. "I think that was a really humbling experience for our kids to end like they did. "It kind of catapulted us into the offseason. It helped the kids motivate themselves. As a coaching staff, that helped us mold them in the direction we wanted them to go, but it was all team-led. We had great team leadership this year." See and hear the complete episode – including Kay on coaching in Texas, administrative support and athletics as the best at-risk program – in the video below. North Shore's unbeaten season brought not only the Texas Class 6A-Division I state title but a final No. 1 ranking nationally from MaxPreps. Kay was named head coach at North Shore in 2014 and has led the Mustangs to a 58-14 record in the five seasons since. Prior to being promoted to the top spot, he was the program's defensive coordinator for 15 seasons. Head coach Jon Kay instructs his North Shore Mustangs during a November playoff game with Houston-area rival Katy.